Budding young chefs took part in a Masterchef Challenge at the University of Brighton in Eastbourne. 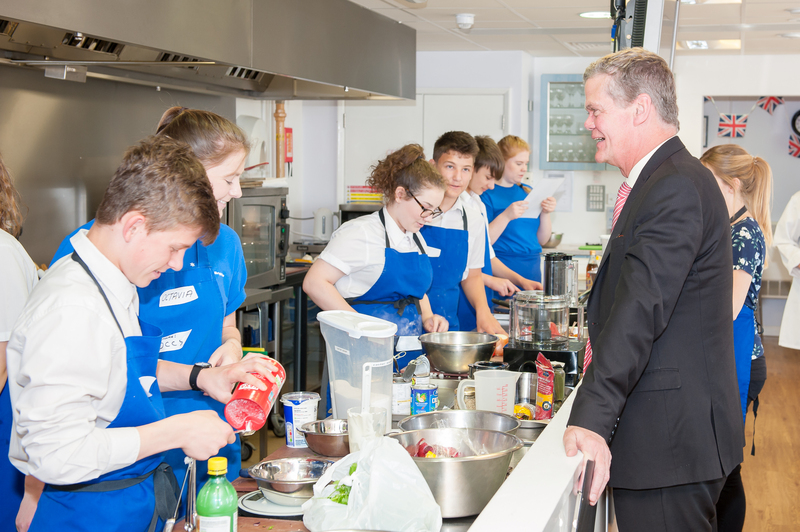 The week-long challenge saw five schools from across Sussex preparing and cooking meals for visitors including Eastbourne MP Stephen Lloyd. Students from Cavendish School in Eastbourne served up a four-course meal in the University’s Culinary Arts Studio, supervised by University staff and student ambassadors. Students were split into teams to prepare each of the courses and each was judged by Stephen Lloyd, Professor Jo Doust, Head of the School of Sport and Service Management, and Jacky Langford, the School Manager. The event formed part of the University’s Compact Plus Programme which works with students from a range of backgrounds to help support them with information about university, talks and activities throughout their studies and into their careers. Stephen Lloyd said: “It was fascinating … to see the way student ambassadors supported the youngsters in preparing and cooking the meals, to watch as the schoolchildren themselves engaged with the whole process, and then to cap it all off with a delicious meal. Marina Trowell, a University’s Outreach Coordinator, said: “The Masterchef Challenge is a great opportunity for school students to meet current University students and staff and to learn first-hand what it is like to be on a university campus. This entry was posted in Community, Hospitality, School News, Widening Participation by Kerry Burnett. Bookmark the permalink.